"I wish that I could fly like the birds." This morning I awoke to the sound of rain. Pitter patter, pitter patter. I got up and looked outside at the lake in my back yard, it was full of happy turtles. Most turtles are green they were dancing in the rain in celebration of St. Patrick's Day. 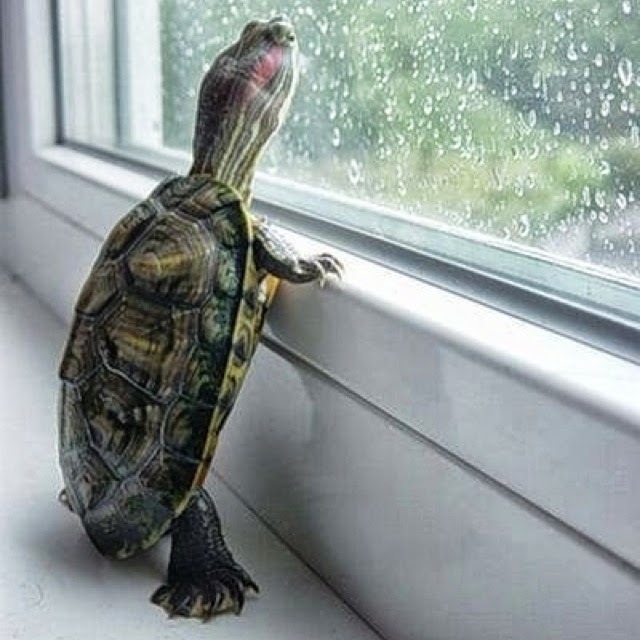 I watched the turtles for a while then I went on my Pinterest page and someone had pinned this picture of a turtle looking out the window at the great outdoors and all it's beauty. Made me wonder what this turtle may have been thinking...and then I started thinking, and thought ~ (what is it about turtles that fascinates me?) Maybe it's the way they can pull their arms and legs, and head into their protective shell when they are frightened. They can breathe under water and swim with that shell on their back, that's pretty cool. They have curious eyes, and I love the way they stretch their necks out and look around. So full of wonder. Turtles are a work of art. Even though there isn't a real meaning to this blog post today I loved this photo and wanted to share it. Everyday I'm reminded that beauty, and wonder surround us. As I write this a bird is singing in the background, the rain is falling, everything outside my window is green. The sky is gray and my mind is full of wonder...Happy St. Patrick's Day 2014!